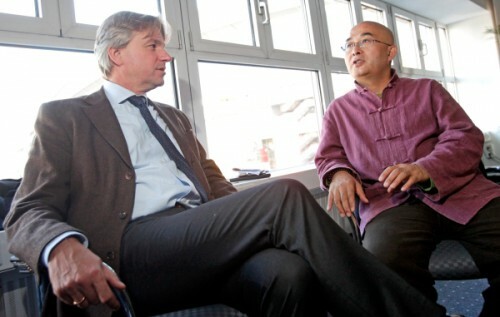 Liao Yiwu, Chinese author and dissident, speaks to Juergen Boos, director of the Frankfurt Book Fair, in 2010. Photo: Alexander Heimann, Frankfurt Book Fair. For writers and publishers in Frankfurt on the Main, October is a busy season. One October, two years ago, the 52 year-old Chinese writer Liao Yiwu left his country for the first time in his life to go to the Frankfurt Book Fair. On the train he heard the announcement that his friend Liu Xiaobo was awarded the Nobel Peace Prize. Tears ran down his checks, the joy was so overwhelming. This year the situation was repeated: He received news, on the train to Frankfurt, that his colleague Mo Yan had become the new Nobel laureate for literature. Instead of joyous tears, Liao was dumbstruck. He totally disagreed with the decision. For him Mo Yan belongs to the Party establishment. Should Mo Yan come to the Frankfurt Book Fair again, Liao doesn’t want to meet with him. Liao Yiwu is in harmony with his new Western life. Since last summer he has lived in Berlin, bathed in prizes and honor. His books are published in German, English, French, Polish, and Portugese. He’s this year’s Friedenspreis winner of the German Book Trade. Seldom has someone who stands in the spotlight of Western society spoken out so unmistakably on the reality in China, pointing the finger at the perpetrator—the ruling party of the CCP. After Liao’s speech, the official Chinese newspaper Global Times published an article saying: “The speech makes some people doubt his judgment and the ability to control his own emotions. It’s surprising that Germany picks such a bigoted person as the award winner. Shouldn’t those attending the ceremony, including German President Joachim Gauck, blush for Liao’s hysterical speech?” Furthermore the article’s author calls the exiled Chinese dissidents “losers in each society.” The next day the newspaper published a comment from Mr. Kong Qingdaong, professor at the Chinese Department of Peking University. He wrote: “People have the freedom to be schizophrenic.”Many big names have been on the prestigious Friedenspreis winners list: Albert Schweizer, Hermann Hesse, Vaclav Havel, Jürgen Habermas, Susan Sontag etc. Liao is the first Chinese writer to stand on this queue of international prominence. Conscious of his historical role, Liao made a general review of the Chinese regime in his acceptance speech on October 14th at St. Paul’s Cathedral, entitled “The Empire Must Fall Apart.” The title alone was eye-catching. Liao’s speech started with the death of a nine year-old boy during the Tiananmen massacre and traced back over two thousand years of Chinese history. In ancient China the country was divided into dozens of states and civilization was flourishing through the decentralized status quo. Even the tyrannical “First Emperor of Qin” (259-210 BC), who burned books and buried 460 intellectuals alive, could not compete with Mao Zedong. The latter was proud that the CCP had purged hundreds of thousands of “counter-revolutionary” intellectuals, thousands times more than the First Emperor. Because of the 40 million dead under the regime, the suppression of dissenters, religious people, peasants, workers, lawyers, and Tibetans, Liao denounced the legitimacy of the “blood-stained empire” and called China a “source of global disasters” and an “ever-expanding garbage dump.” At the same time he harshly criticized western companies which, through their business, have become accomplices in destroying and polluting the environment, and extending the life of themonstrous empire. The facts are exactly the opposite. Liao and many other Chinese leave their country because they are deprived of basic human rights; they are discriminated or suppressed because of their religion, their independent thoughts, and behavior. Liao was imprisoned for four years because of his long poem “Massacre” in 1989. He sank to the bottom of society after he was released. He was indeed a loser in his home country. Yet in the Western world, his works are translated, understood, and admired by his readers. But Liao does not only represent himself; in his work he gives the silent majority in China a voice and a face. He tells their unknown stories as victims of social and political injustice. His new book in German, Die Kugel und das Opium(The Bullet and the Opium, to be published in English by Amazon, 2013) is about the fates of 17 Tiananmen victims, most of them young men, who got involved at the incident and spent years in prison. After their release they truly became losers in material- and money-oriented Chinese society. This book will be another treacherous document in eyes of the Chinese authority. The audience at St. Paul’s Cathedral was moved by Liao’s courage in speaking the truth. The Germans have a strong sense of history. The Holocaust complex is deeply rooted in people’s conscience. After all, they have had the experience of suffering under totalitarianism twice in last century. When a Chinese writer accuses his government of committing crimes of inhumanity, violence, corruption, ethnic segregation, and discrimination, he finds the audience on his side. No one thinks Liao Yiwu is hysterical—except the accused. The German president Gauck, who used to be a priest in East Germany before the reunification, gave a short talk during the luncheon that followed. He said Liao’s speech was especially touching, because what he said was almost the common nightmare of the Germans. Not long ago, a part of the country was living under similar circumstances. He stressed that Germany should offer shelter to those who suffer under tyranny. I have known Liao Yiwu for years through his writing. He abandoned poetry after spending four years in prison. The prisoners’ brutal and hopeless situation ruined his interest in writing poems. He heard and experienced so many tragedies through and in prison that he decided to chronicle the time. Since the perpetrator (CCP) is dictating history, Liao writes down the people’s stories. Should there be written history in China, it must not be the history of the ruler and its accomplices, but the history of the common people. Editor's NOTE-- Tienchi Martin Liao is the president of the Independent Chinese PEN center. She also writes for the online magazine Sampsonia Way, and the above article is copy-pasted from the original publication.